A good survival shovel is just about one of the most useful multi-tools you can take along on an outdoors trip. It will help you set up camp and un-set it, make your way through the wild, get ahead if climbing rough surfaces, open up cans and bottles, get rid of nails, handle the fire, fix up your car or small appliances etc. This can all vary depending on the exact features of the tool you choose, but there’s no denying your need for one if you’re planning a camping or hiking trip. To help you get the best survival shovel for your needs, we’ve prepared this list of the top-rated folding shovel options. Take a look and pick the best one for your needs. This military-grade survival multi-tool shovel was designed following the feedback of many outdoor enthusiasts engaged in a whole variety of activities and situations. What resulted is a perfect balancing act between the various needs which can arise when you’re out in the wild. It includes the following tools: shovel board, hexagonal wrench, saw, bottle opener, nail extractor, hoe, fish scaler, emergency whistle, fire bar. Also, it has an extension bar which you can use to adjust its length to how you feel most comfortable using it (especially for stand-up digging). The compact shovel also includes a pouch for easy storing and carrying, making it perfectly portable and convenient. If you like going on impromptu adventures and camping is your second nature, this is the best folding shovel for you. 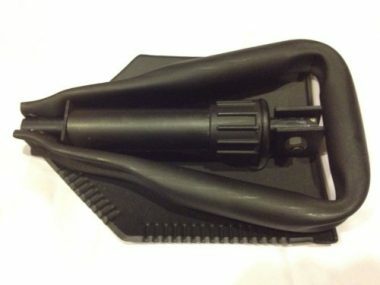 Another military-grade portable shovel, this US GI military tool is designed for entrenching and heavy work. You can lock it in multiple lengths and positions, use it as a grappling hook, ice pick or even as a chair (if you are caught somewhere without a seat). 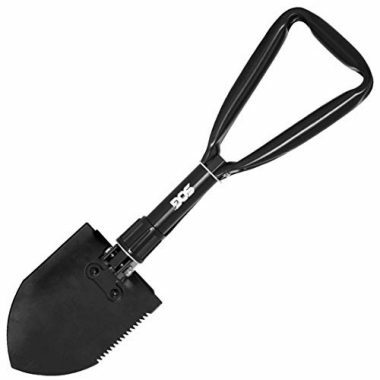 According to survival shovel reviews, this one is more durable and heavy-duty than most of its counterparts. For tough jobs and adventuring in rough spots, this is the best folding shovel to have. So, if you’re planning a hiking or camping trip in an unwelcoming landscape, this is a great shovel to take along. When folded, this compact shovel is barely bigger than your hand, and thus highly portable. Still, when it unfolds, this sturdy backpacking shovel proves to be the perfect ally for hard jobs. It’s the perfect companion on a camping trip, since it can be easily used as a camp shovel, snow or sand shovel, wood saw or pick. If you’re feeling more domestic, you can also use it as a gardening shovel. All in all, it’s a super-durable mini tactical shovel that you can carry on your belt. For making your way in outdoors, it’s a perfect pick. The Gerber E-tool is somewhat of a cult icon among camping and hiking enthusiasts. Almost all survival shovel reviews compare their target to the Gerber E-tool, seeing how it stacks up against it (or not). In our opinion, this item is the best survival shovel if you’re planning to make your way through a wild scenery or in the woods. The serrated edge is especially suitable for chopping roots and branches, allowing you to clear a path (or turn an unwelcoming patch into a garden). Of course, as a top-rated folding shovel, the Gerber E-Tool does much more than chop and saw roots. It’s also an easy to use collapsible digging aid, perfectly suitable to hard environments (grass, ice, undergrowth or hard dirt don’t stand a chance). Meant to be highly durable, this portable shovel is also safe to use (no risk of injuries), due to the safety locking mechanism. A pretty affordable choice, this top-rated folding shovel is great for getting all sorts of debris and hard ground out of the way. Especially if you’re going on an outdoors adventure by car, you should store one of these around for making sure you can get out of a tight spot if needed. It’s also the best folding shovel for setting up your camping area or doing a bit of gardening. It folds to a mere 9 inches through its tri-fold system and it is also guaranteed to last a lifetime. The Smittybit compact shovel is an official Jeep accessory and will accompany you on any off-road adventure you feel like going on. This utility shovel is modeled after the Soviet Spetznaz design which was a standard part of the Russian soldier’s retinue. This seemingly simple tool comes equipped with a hardwood handle and a belt hoop to hand it from. 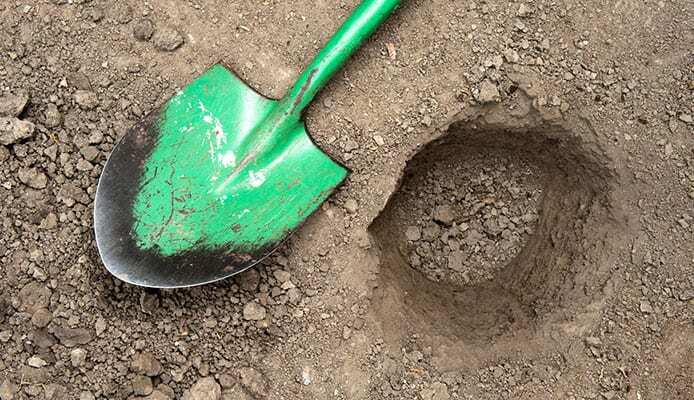 After you give it a try, you’ll be surprised at how easily it allows you to dig through some of the hardest surfaces to be encountered outdoors, and how durable it is. It’s the best survival shovel especially if you’re venturing in a cold area (like a winter camping trip). Its steel, already strong to begin with, is heat-treated at the end of the manufacturing process in order to give it maximum strength. The axe-like edges can be easily improved to razor-sharpness, should you need it to have this function as well. The best folding shovel for light camping trips, this popular Gerber tool also doubles as a hammer, perfect for pounding in the tent stakes. It’s designed to be easy to carry and easy to use. A simple button will make it unfold into a full position, and you will be able to carry it around easily in a drawstring bag. The ergonomic handle comes with a rubberized grip, making it easy to use, even if you need to dig around for long periods of time. It’s a great camping shovel or backpacking shovel for all nature lovers, as long as you’re not looking for a more sophisticated multi-tool complex intended for surviving in extreme conditions. Another mini tactical shovel with a hardwood handle, the Cold Steel tool is also inspired from the Soviet Spetznaz shovel. It will allow you to dig through and make your way through any kinds of difficult terrain, including a heavily frozen landscape. The head and socket are made from ultra-strong heat-treated steel. The shovel’s edge is approximately 2 mm thick and can be sharpened as often as you’d like for maximum efficiency. It’s the perfect hiking shovel for rough environments. A survival multi-tool shovel meant to help you out in a variety of situations, this folding item is perfect for adventure lovers. No matter the kind of trip you’re going on (hiking, backpacking, camping, climbing, fishing etc. ), this is the best survival shovel to take along. Fans of versatility are thrilled to see all the things this tool can accomplish. Digging, sawing, chopping, picking, prying, cutting, hammering and even opening bottles are easy as pie with this military-grade compact shovel in your hands. 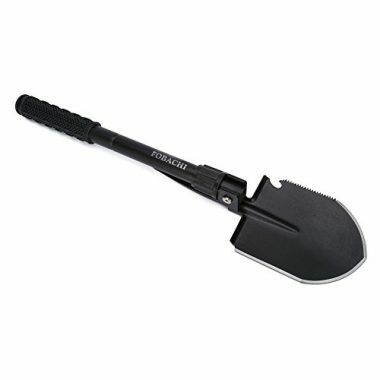 A tactical shovel made from a virtually indestructible material, this United Cutlery tool is the best survival shovel to take along with you on a hiking or camping trip. It’s perfect for digging, light chopping and as a self-defense weapon in a dangerous situation. Its pointy end is sharpened, while one edge is serrated and the other one is concave, perfect for chopping. Take note that it doesn’t fold, but you can still carry it around in its sheath and reinforced nylon belt pouch (which you will receive along with this backpacking shovel upon purchase). According to most survival shovel reviews, it’s perfect for outdoor camping and it holds its edge very well over the years, with no sharpening required. 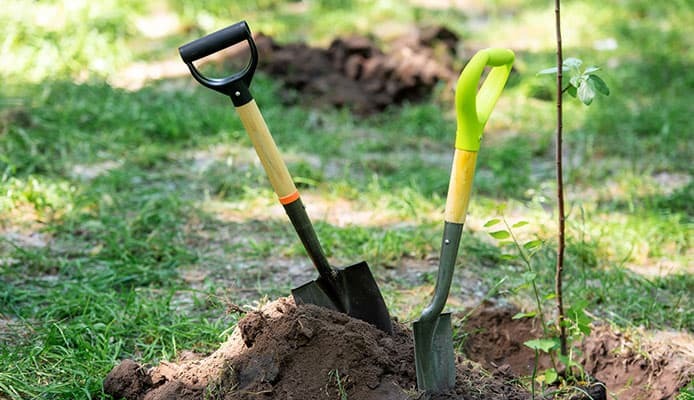 Now that you know how the best 10 survival shovels look like and have an overview of their features, here’s how you can decide which of those features you need and how to choose the best folding shovel for your needs. First of all, think of answering yourself the most basic question, that should be at the beginning of your buying process: what are you going to use it for? If you tend to go mostly on winter camping trips, you need a tactical shovel that will be able to dig through frozen ground and which doubles up as an ice pick. If you go on light camping trips with minimal luggage, you could probably benefit more from a survival multi-tool shovel that can also help you create a fire, open bottles and so on. When shopping for the best survival shovel for your needs, pay attention to the material the head is made of. You’re looking for something extra durable, like reinforced nylon or heat-treated stainless steel (such as the one used for the Soviet-style military tactical shovel). 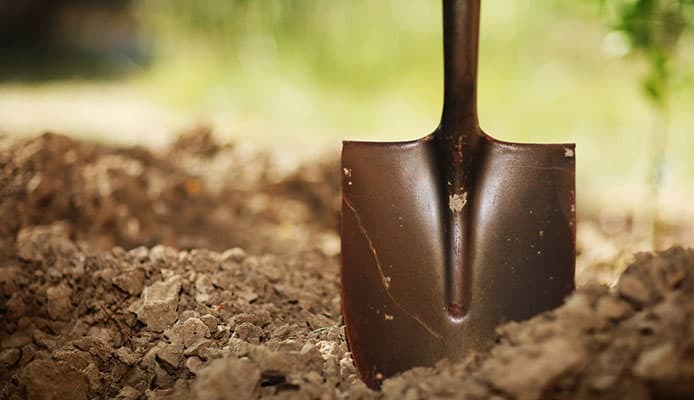 If the shovel head is made of metal, it’s heavier and easier to use for entrenching, but it will need sharpening from time to time, whereas the nylon-based ones won’t. Also, the edges of the shovel head can have different features. A serrated edge has an all-round usefulness so you should look for this regardless of your specific needs. 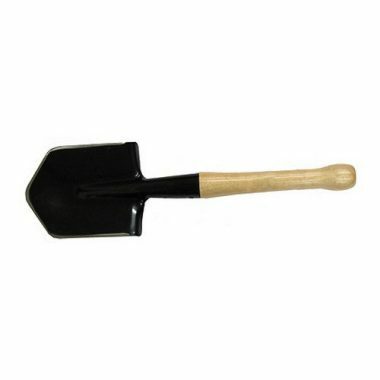 A sturdy wooden handle can carry the weight needs to help you operate the camping shovel more effectively. However, a folding handle means you get a portable shovel which can come in handy when packing light. Usually, folding shovels make up for the minus weight they sometimes carry through increased sharpness. As far as size goes, any survival shovel is not as big as a regular shovel. Usually, a standard backpacking shovel is around 16 inches long. They are all meant to be portable, so regardless of whether they are compact and folding or not, you can carry them on your belt with a pouch and a loop, protected by a sheath. All of the models featured on our list qualify for this kind of portability. 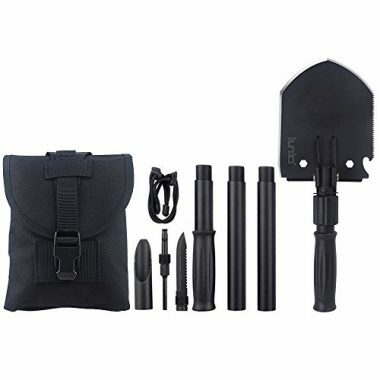 A reliable tactical shovel shouldn’t be too heavy, since the whole point of having a good portable shovel is to be able to carry it around easily. A standard weight to expect from such a tool is between 6 and 8 ounces. As mentioned above, some survival shovels come with a variety of extra tools incorporated. If you’re looking for an all-round useful camping shovel, then it would be worth looking into such a survival multi-tool shovel. Bottle opener, fire starter… you name it. 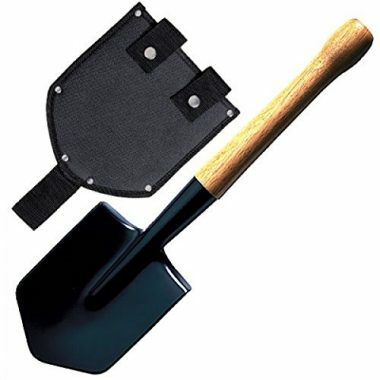 If you already carry these separate tools around (for instance, if you go adventuring with an off-road car), then maybe look for a tactical shovel which can be more useful for digging your wheels out when they’re stuck in the ground or which can be used as an ice pick and so on. All of the best survival shovels are built to last, but some (the ones made of stainless steel) should also be sharpened from time to time. Depending on how often you use it and for what kind of jobs, the sharpening will need to be performed more or less often. The nylon-based type of tactical shovel won’t need to be sharpened and may keep its edge better. All great brands guarantee a lifetime use of their products, so if you go for a model featured on the list above, durability won’t be an issue. Q: What Is a Survival Shovel? 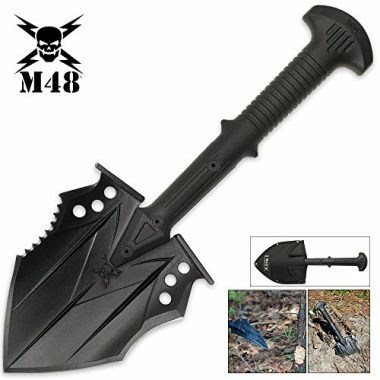 A: A survival shovel is a tactical tool originating in military history, with a design which has proven its usefulness in a variety of outdoor situations. It’s great for camping, hiking, gardening and other survival-related situations, and it can even come in handy for industrial purposes. Its edges are perfect for chopping roots while digging and trenching, for setting up camp, for helping your car get out of a tight spot during off-road adventures and so on. Q: Why Do I Need a Survival Shovel? A: If you like adventuring in the great outdoors, a reliable camping shovel is about the best survival tool you can have on hand. It’s relatively small and easy to carry around (compared to a regular shovel), but really sturdy and helpful in a variety of situations you will encounter while hiking, camping, climbing etc. It will help you set up camp, dig a fire hole or a sanitation hole, help move your car or tent, chop through cumbersome vegetation, do minor repairs on your equipment, fight wild animals and so on. Few other tools are as needed during outdoors adventures, to take a look at your top of the best survival shovels above and pick the best one for your needs. You’ll thank us later. We hope our guide with survival shovel reviews has helped you understand better the different features of these tools and how to choose one that fits your needs. There’s no such thing as the best folding shovel for everyone, since it all depends on the types of outdoor adventures you are likely to go on. Now that you know which tool will help you make yourself at home anywhere, you’re ready to take on the wilderness. Happy camping! Outdoor Safety During a Winter Storm, CDC.gov. The Outdoors Camping and Survival Guide, Gov.mb.ca. Have you used a tactical shovel so far, and if so, what for? 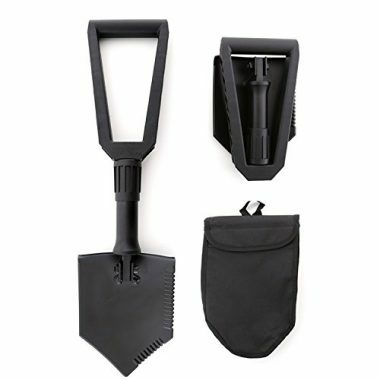 Do you use a survival shovel around the house for yard work or do you use a camping shovel only when you go on a trip? What’s a fun situation in which a compact shovel helped you get out of a tight spot? Do you have any advice for our other readers looking for a best pick? Share your thoughts with everyone in the comment section below!